An airman of the 401st Bomb Group updates the operations board. 13 January 1945. 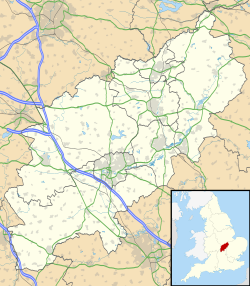 Royal Air Force Deenethorpe or more simply RAF Deenethorpe is a former Royal Air Force station located 2 miles (3.2 km) east of Corby, Northamptonshire, England. Deenethorpe was constructed in 1943 and was allocated to the United States Army Air Forces Eighth Air Force. It was assigned USAAF designation Station 128. With the opening of the airfield in October 1943, the 401st Bombardment Group (Heavy), arrived from Great Falls AAB, Montana, in November. The 401st was assigned to the 94th Combat Bombardment Wing of the 1st Bombardment Division. Its tail code was Triangle-S. The 401st BG operated chiefly against strategic targets, bombing industries, submarine facilities, shipyards, missile sites, marshalling yards, and airfields; beginning in October 1944, concentrated on oil reserves. The Group received a Distinguished Unit Citation for striking telling blows against German aircraft production on 11 January and 20 February 1944. In addition to strategic missions, group operations included attacks on transportation, airfields, and fortifications prior to the Normandy invasion and on D-Day, June 1944; support for ground operations during the breakthrough at Saint-Lô in July, the siege of Brest in August, and the airborne attack on the Netherlands in September 1944. The Group flew missions against enemy forces during the Battle of the Bulge, December 1944 - January 1945, by assaulting transportation targets and communications centres in the battle area; and support for the airborne attack across the Rhine in March 1945. The worst accident occurred on 5 December 1943 when a Fortress which failed to get off the ground careered over farmland and came to rest after crashing into a cottage on the edge of Deenethorpe village. The surviving members of the crew just had time to evacuate the wreckage and warn the villagers of the imminent explosion of the bomb load before it detonated damaging many houses in the village. The blast was felt in Kettering nine miles away. After V-E Day, the group departed from Deenethorpe in August 1945 and returned to Sioux Falls AAF where the unit was inactivated, personnel demobilized and B-17 aircraft sent to storage. The 401st Bombardment Group had flown 255 combat missions from Deenethorpe airfield. After the war, Deenethorpe was used as a RAF Recruiting Centre, and later for several years the control tower was used as a lookout post by the local Royal Observer Corps. It was finally sold in 1963 and largely returned to agriculture. Part of the old main runway is now used as a private airstrip. The 600 acres (240 ha) airfield is one of the sites that has been approved for a "garden village" in 2017. The plans include a village green, shops and community hall, as well as more than 1,000 homes. On 17 June 2011 the widow of an American air crewman who took part in bombing raids from the airfield buried a time capsule on the crew's behalf. Joan Parker was married to Tom Parker, the last of the eight-man 401st Bombardment Squadron crew, that flew the B-17 plane Lady Luck out of Deenethorpe. In a ceremony, Mrs Parker buried eight glass-bottomed tankards along with a story of the men at the airfield. The crew carried out raids on marshalling yards in Berlin. "It was all agreed that whoever was the last one would bring the tankards back to Deenethorpe," she said. "It took some time trying to gather all of the information." The tankards were a gift from the pilot of Lady Luck, Lt Bob Kamper who presented them to the crew at a reunion in 1972. Mr Parker, the last member of the crew, died in March 2011. ^ "Deenethorpe". American Air Museum in Britain. Retrieved 2 Mar 2015. ^ "431st Service Group". American Air Museum in Britain. Retrieved 2 Mar 2015. Wikimedia Commons has media related to RAF Deenethorpe.